Utilities Employees Credit Union, the billion dollar virtual credit union that serves the U.S. utility and energy sector, has been ranked among the nation’s most fiscally sound financial institutions, with an A+ “Excellent” Weiss Rating. Utilities Employees Credit Union, the billion dollar virtual credit union that serves the U.S. utility and energy sector, has again been designated as one of the nation’s most fiscally sound financial institutions. For the second year in a row, UECU has been recognized with the highest A+ “Excellent” ranking from the independent Weiss Ratings firm, a distinction shared by less than 1% of U.S. credit unions. UECU was one of only 28 of the nation’s 7,000 credit unions to receive the A+ designation in 2011, the first time credit unions’ financial strength was ranked by Weiss Ratings, which evaluates the nation’s credit unions, banks, and insurance companies. In the first rating cycle of 2012, only 4.8% of the nation’s credit unions were given an overall A or “Excellent” designation, with less than 1% scoring the highest A+ “Excellent” rating. 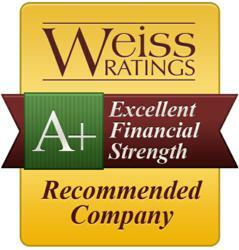 Weiss Ratings defines an institution with an “Excellent” financial security rating as an institution that maintains conservative operations and loan underwriting practices demonstrated by a “strong equity base, top-notch asset quality, steady earnings, and high liquidity.” Weiss Ratings has evaluated the safety of banks since 1971 and began rating credit unions last year. Weiss analysts use scrupulous standards to measure the financial soundness of institutions and their ability to withstand future economic adversity. Ratings are based on measurements including asset quality, capitalization, stability, profitability and liquidity. The Weiss Rating scale uses six levels: Excellent (A-/+), Good (B-/+), Fair (C-/+), Weak (D-/+), Very Weak (E-/+) and Failed (F). Utilities Employees Credit Union achieves a high level of financial efficiency through its business model as a branchless, virtual credit union serving a nationwide membership from its single Pennsylvania headquarters. UECU has provided financial services to utility and energy workers and their families since 1934. Its membership includes the employees of 600 companies and members of Energy People Connect, an association for individuals currently employed or pursuing employment in the energy industry. UECU is a full-service financial institution with member-focused savings, checking, lending, and credit card products. It is one of the few U.S. financial institutions to reward its members with a year-end bonus dividend, which last year totaled $1.2 million. UECU also offers membership, financial products, and financial wellness education as a free voluntary benefit for utility companies to extend to employees and their families in order to promote financial wellness and enhance worker productivity. For more information about Utilities Employees Credit Union, visit http://www.uecu.org. Information about Weiss Ratings and its standards for evaluating financial institutions are available on their website at http://www.weissratings.com.